O.K., so first of all, forget everything I wrote about switching to a dot com address. I am not technologically literate enough to do it right now. I thought it was as simple as buying the domain name and letting Blogger make the transfer. Turns out I have to also get separate DNS hosting. I don't even know what that is! And when I tried to set up a DNS hosting account, it was like reading another language. And I freaking minored in Latin. I'm good with other languages! If they're real languages. This was just gibberish. Besides entering my name, I had no idea what they even wanted from me, or what I was supposed to do with what they spit back at me. So, forget that. I'll stay right here on good ol' Blogspot, home of the technologically challenged mommy blogger. And if you get a "server too busy" message once in a while, I'm sorry. I'll send you some chocolate or something to make up for it . ANYWAY. That wasn't the point of this post. I wanted to share with you an actual, word for word e-mail exchange between myself and Will. It probably tells you more about both of us than anything else ever could. My SD card says it's locked. I can look at pictures that are on it, but I can't delete them, edit them or upload them. I also can't take any more pictures with it. I didn't lock it (I don't even know how! ), and it was working just fine yesterday afternoon when I used it. Any idea how to fix it? I went to properties for the card, but didn't see anything that suggested locking or unlocking. Help me Obi-Will Kenobi. You're my only hope. Silly girl. Some USB drives and SD cards have a PHYSICAL switch on them. Slide it the other way. You're a freakin' GENIUS! It's fixed now. And Han is kind of a douche. Young Obi-wan was hot. 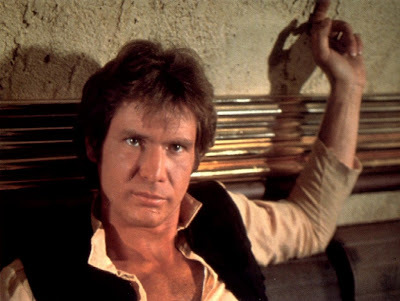 OK but Han comes around and isn't such a douche later on. I thought girls like jerks?! Not smart girls with self esteem. Obviously Padme had issues or she wouldn't have stayed with Annakin (even douchier than Han, even before he turned into Darth Vader). And Leia must have inherited the stupidity, because I would have let Han rot in carbonite after his "I know" comment. Smart, well adjusted girls would go for (young) Obi-wan every time. Even though Han is hotter?